Cessna Aircraft Company has pioneered the use of innovative high-tech marketing tools to showcase the Citation X, the fastest business jet in the world. While entertainment companies have enjoyed the monopoly and benefits of DVD production, corporate America is now beginning to explore the advantages of using the latest technology to create user-friendly virtual experiences to showcase company products and services. Cessna Aircraft Company recently completed the "Citation X DVD Experience," known in the industry as a multimedia milestone and the first interactive, web-enabled DVD, designed as a marketing and promotional tool. To date, the DVD has won The Aegis, Telly, Omni, Aime, Axiem, and Videographer awards. The interactive DVD utilizes the latest Quicktime VR technology for an amazing 360 degree virtual tour of the inside and outside of the Citation X. The experience reveals combinations of interior and exterior designs and paint combinations, state-of-the-art Avionics and world-class comfort, 21st century performance of the aircraft, domestic and international time travel, and support services. One can even experience what it's like to pilot the Citation X, flying at Mach .92, just a fraction below the speed of sound - an experience not even a seasoned pilot could resist. Other cutting-edge technologies and design applications used include the capability to link directly to the Cessna Citation X web site. By utilizing PC Friendly software, the user is able to access the Internet through the video space on the DVD. Its virtual tour experience of being able to stroll through the large, comfortable cabin and flight deck as if you were there, is envelope-pushing delivery in DVD technology. Tom Zwemke, Director of Communication Programs for Cessna Aircraft Company says, "The Citation X Experience DVD provides the viewer the next best thing to actually flying the aircraft itself. It was designed from the beginning to entertain, inform and allow the viewer to interact as much as or as little as the person desires. The DVD truly portrays the Citation X as the fastest and most technologically advanced business jet in the world at Mach .92, or over 600 miles per hour." In addition, the DVD is Mac & PC compatible with hybrid capabilities of playing on both a DVD-ROM and a set-top player, which gives the user a choice of full interactivity or Auto Play. The project incorporates Cessna's most majestic aerial cinematography in full-screen, full-motion film clips, enhanced with breathtaking music in 5.1 surround sound. The DVD employs an unprecedented 50+ motion menus, enabling the user to seamlessly navigate to any category of the DVD. 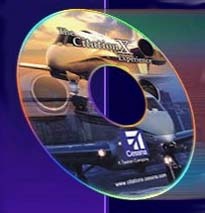 Jeffery Goddard, Executive Producer for TVA Productions which spear-headed the project, states that, "The Cessna Citation X DVD is not only a milestone for multimedia, but also a milestone for corporate marketing. The DVD experience is truly one of the most provocative interactive sales and marketing tools available that opens up a whole new world of advertising effectiveness for corporations." Cessna has always been a leader in aviation technology and has applied the same leadership initiative, commitment, and investment in the Citation X DVD production. The result is: a combination of cutting-edge technology and design, award-winning cinematography, creative 2-D & 3-D graphics and animation, original music composition, and programming genius. The Citation X DVD gives Cessna's prospective clients the closest thing to a Citation X flight experience as possible, without leaving their homes or offices. ComChoice Corporation, a Gardena, CA based interactive marketing and promotions agency; CVC, a Time-Warner Entertainment Company; InterActual Technologies; PC Friendly; Premier Communications; Clay Lacy Aviation; Robert Etoll Productions; Sirius Star Entertainment; Joseph Campanella, Narrator; Neal Thompson, Raval Media Director of Graphics; AceFx, 3-D Animation; Overlode Productions; Interactive Edge; Sullivan, Higdon and Sink Advertising Agency; and 360 Wichita - to produce the úCessna Citation X DVD experienceî.